LEAP/E2020 is of the view that the effect of States’ spending trillions to « counteract the crisis » will have fizzled out. These vast sums had the effect of slowing down the development of the systemic global crisis for several months but, as anticipated in previous GEAB reports, this strategy will only have ultimately served to clearly drag States into the crisis caused by the financial institutions. Therefore our team anticipates, in this 42nd issue of the GEAB, a sudden intensification of the crisis in the second half of 2010, caused by a double effect of a catching up of events which were temporarily « frozen » in the second half of 2009 and the impossibility of maintaining the palliative remedies of past years. As a matter of fact, in February 2010, a year after us stating that the end of 2009 would mark the beginning of the phase of global geopolitical dislocation, anyone can see that this process is well established: states on the edge of bankruptcy, remorseless rise in unemployment, millions of people coming to the end of their social security benefits, falling wages and salaries, limiting of public services and disintegration of the global governance system (failure of the Copenhagen summit, growing Chinese/US confrontation, return of the risk of an Iran/Israel/USA conflict, wars worldwide… (1)). However, we are only at the start of this phase for which LEAP/E2020 will supply a likely timeframe in the next GEAB issue.
. a growing social insecurity. In this GEAB issue our team expands on the first three trends of these developments including an anticipation on Russia’s position in the face of the crisis, as well as, of course, our monthly suggestions. In this public announcement, we have chosen to analyse the « Greek case », on the one hand because it seems indicative of what 2010 has in store for us, and on the other because it is a perfect illustration of the way in which news and information on the world crisis is moving towards « make-believe news » between blocs and interests which are increasingly in conflict. Clearly it is a « must » to learn how to decipher worldwide news and information in the months and years to come which will be a growing means of manipulatory activity. 1. As we stated in our anticipations for 2010, which appeared in the last GEAB issue (GEAB N°41, the Greek problem will have disappeared from the international media’s radar several weeks from now. It is the tree used to hide both a forest of much more dangerous sovereign debt (to be precise that of Washington and London) and the beginning of a further fall in the world economy, led by the United States (2). 2. The Greek problem is an internal issue for the Eurozone and the EU, and the current situation provides, at last, a unique occasion for the Eurozone leaders to require Greece (a case of « failed enlargement » since 1982) to leave its feudal political and economic system behind. The other Eurozone countries, led by Germany, will do the necessary to make Greek leaders bring their country into the XXIst century in exchange for their help, at the same time making use of the fact that Greece only represents 2.5% of Eurozone GDP (3) to test the stabilisation mechanisms that the Eurozone needs in times of crisis (4). 3. Ango-Saxon leaders and media are using the current situation (just like last year with the so-called banking tsunami coming from Eastern Europe which was going to carry the Eurozone away with it (5)) to hide the catastrophic progression of their economies and public debt and attempt to weaken the attractiveness of the Eurozone at a time when the USA and the United Kingdom have increasing difficulty in attracting the capital which they so desperately need. At the same time Washington and London (which, since the coming into effect of the Lisbon Treaty is completely excluded from any management of the Euro) would be overjoyed to see the IMF, which they control completely (6), brought into Eurozone management. 4. Eurozone leaders are very happy to see the Euro fall to 1.35 against the Dollar. They well know that it won’t last because the current problem is the fall in the value of the Dollar (and the Pound Sterling), but they appreciate this « whiff of oxygen » for their exporters. 5. The speculators (hedge funds and others) and banks heavily involved with Greece (7), have a common interest in trying to bring about rapid Eurozone financial support for Greece, since otherwise the rating agencies will, unintentionally, pull a fast one on them if the Europeans refuse to dig into their pockets (like the scandalous actions of Paulson and Geithner over AIG and Wall Street in 2008/2009): indeed a lowering of Greece’s rating will plunge this small world into the throes of serious financial losses if, for the banks, their Greek loans are similarly devalued, or if their bets against the Euro don’t work out in due course (8). In the « Greek case », just like in every suspense story, a « bad guy » is needed (or, following the logic of an old-style tragedy, a « deus ex machina »). In this phase of the global systemic crisis, the role of the « bad guy » is usually played by one of Wall Street’s big investment banks, in particular by the leader of the gang, Goldman Sachs. The « Greek case » is no different as indeed this New York investment bank is directly implicated in the budgetary conjuring tricks which allowed Greece to qualify for Euro entry, whilst its actual budget deficits would have disqualified it. In reality it was Goldman Sachs who, in 2002, created one of its cunning financial models of which it holds the secret (9) and which, almost systematically resurfaces several years later, to blow up the client. But what does it matter, since GS (Goldman Sachs) profits were the beneficiary! In the Greek case what the investment bank proposed was very simple: raise a loan which didn’t appear in the budget (a swap agreement which enabled a ficticious reduction in the size of the Greek public deficit (10). The Greek leaders at the time were, of course, 100% liable and should, in LEAP/E2020’s opinion, be subjected to Greek and European political and legal process for having cheated the EU and their own citizens within the framework of a major historic event, the creation of the single European currency. But, let’s be clear, the liability of the New York investment bank (as an accomplice) is just as great, especially when one is aware of the fact that Goldman Sachs’ vice-president for Europe was, at the time, a certain Mario Draghi (11), currently President of the Italian Central Bank and a candidate (12) to succeed Jean-Claude Trichet at the head of the European Central Bank (13). Without wishing to pre-judge Mr. Draghi’s role in the affair of the loan manipulating Greece’s statistics (14), one should ask oneself if it wouldn’t be worthwhile to question his involvement in the affair (15). In a democracy, the press (16), like parliaments (in this case Greek and European), are expected to take on this task themselves. Considering the importance of GS in world financial affairs these last few years, nothing that this bank does should leave governments and legislators indifferent. It is Paul Volcker, current head of Barack Obama’s financial advisors, who has become one of the strongest critics of Goldman Sachs’ activities (17). We already had the occasion to write, at the time of the election of the current US President, that he is the only person in his entourage having the experience and skills to push through tough measures (18) and who, at this moment, knows what, or rather whom, he is talking about. With this same logic, on the issue of transparency in financial activities and state budgets and using the ill-fated role of Goldman Sachs and of the large investment banks in general as an illustration, LEAP/E2020 takes the view that it would be beneficial for the European Union and its five hundred million citizens, to exclude former managers of these investment banks (19) from any post of financial, budgetary and economic control (ECB, European Commission, National Central Banks). The mixing of these relationships can only lead to even greater confusion between public and private interests, which can only be to the detriment of European public interests. To begin with, the Eurozone should immediately require the Greek government to stop calling on the services of Goldman Sachs which, according to the Financial Times of 01/28/2010, it still uses. If the head of Goldman Sachs believes he is « God » as he described himself in a recent interview (20), it would be prudent to consider that his bank, and its lookalikes, can seriously behave like devils, and it is therefore wise to draw all the consequences. This piece of advice, according to our team, is valid for the whole of Europe, as well as every other continent. There are « private services » which clash with « public interests »: just ask Greek citizens and American real estate owners whose houses have been repossessed by the banks! To conclude, our team suggests a game to convince those who seek where the next sovereign debt crisis will surface: simply look for those states which have called upon Goldman Sachs’ services in the last few years and you will have a serious lead (21)! 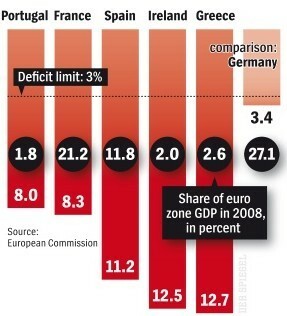 (3) See the chart below which puts the « Greek problem » into proportion against Eurozone GNP. (4) For which GEAB has emphasized the necessity for four years, as well as the wide public support (an average of more than 90% according to GlobalEurometre monthly polls) a Eurozone economic governance could count on. (5) As a reminder here, GEAB N°33 was one of the rare media sources which, in Spring 2008, revealed the dishonest and manipulative aspects of the big fear of a « banking tsunami » coming from Eastern Europe which was supposed to carry away the Eurozone banking system. At the time, the Euro had fallen to much lower levels than those seen today…only to rise again several weeks later. For those who wish to understand the current media position, we suggest a re-read of the GEAB N°33 public communiqué. (6) The fact that a Frenchman is its head changes nothing. (9) With the same highly constructive regard for the countries where it operates as that which led it, in the United States in 2006/2007, to provoke a fall, for its own benefit, in the value real estate based financial products which it had sold to its own clients. (11) During Italy’s preparation for Euro entry, he was Director General of the Italian Treasury. Sources: Bank of Italy; Wikipedia; Goldman Sachs. (13) His strongest adversary is Axel Weber, current head of the Bundesbank. (14) What would be surprising is that the European head of the bank making a loan intended to hide a portion of a country’s public deficit, and himself the former Treasury head of a neighbouring country, should not be aware of such an undertaking. (15) And, considering his past positions, one can only appreciate his sense of humour when he calls for a reinforcement of Eurozone economic management. Source: Les Echos, 02/13/2010. (16) Which, for the present, satisfies itself by copying articles from the Anglo-Saxon press casting the Greek case in the role of « wrecker of world markets » repeating at length that the Euro will fall… whilst it trades at a level which the same media thought it impossible to achieve only four years ago. (18) He belongs to that generation of Americans who built the « post-war US empire », who know its weak points and exactly how it works, contrary to Summers, Geithner and others like Rubin. Our team rarely compliments Barack Obama, but if he continues to listen to the likes of Paul Volcker, he is definitely moving in the right direction. (19) Our team knows, from first-hand knowledge, that there once was a time, thirty years or so ago, when investment bankers would take action having the long term interests of their clients at heart. This period is long gone and now they only act in their own short-term interests. From this, we should draw the inevitable conclusions and exclude them access to key posts in the public service, rather than try and reform their behavior. If there were child investment bankers (as there are child soldiers) one could, perhaps, hope to save a number of them from their addiction to short-term profits, but for adult investment bankers, it’s far too late. (21) For the private sector, ask Lehman Brothers, AIG…they will confirm its accuracy.